Tricuspid atresia is a form of congenital heart disease whereby there is a complete absence of the tricuspid valve. Therefore, there is an absence of right atrioventricular connection. This leads to a hypoplastic (undersized) or absent right ventricle. This defect is contracted during prenatal development, when the heart does not finish developing. It causes the heart to be unable to properly oxygenate the rest of the blood in the body. Because of this, the body does not have enough oxygen to live, so other defects must occur to maintain blood flow. 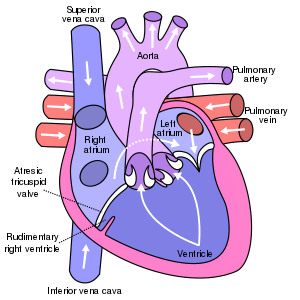 Because of the lack of an A-V connection, an atrial septal defect (ASD) must be present to fill the left ventricle with blood. Also, since there is a lack of a right ventricle there must be a way to pump blood into the pulmonary arteries, and this is accomplished by a ventricular septal defect (VSD). The causes of Tricupsid atresia are unknown. modified Blalock-Taussig shunt to maintain pulmonary blood flow by placing a Gore-Tex conduit between the subclavian artery and the pulmonary artery. This page was last edited on 16 March 2019, at 16:10 (UTC).